Up to a quarter of Niger's 12m people need food aid and 150,000 children could die unless they get help soon, aid workers say. August is normally the height of the rainy season, but there is hardly any rain. Many of the crops which survived the poor rains are then eaten by locusts. Wave after wave of the insects sweeps across West Africa and Niger is one of the worst-hit countries. Crops are normally harvested in October, but even in one of the world's poorest countries - which largely lies in the Sahara desert - this is one of the smallest harvests for many years. The United Nations first appeals for aid but receives hardly any pledges. Many people are running out of food, especially in the southern provinces of Tahoua, Maradi and Zinder. At first the government seeks to play down the scale of the problems. It distributes bags of the staple food, millet, at a subsidised price, but subsistence farmers say they still cannot afford it. Local journalists who report on the growing problem are accused of being unpatriotic and face sanctions. The government's emergency food reserves, built up after similar food crises in the 1970s and 1980s, have been allowed to dwindle. The UN's World Food Programme starts an emergency operation for 400,000 people. The United Nations again appeals for food aid for Niger - this time for $16m. Not a single pledge is received. 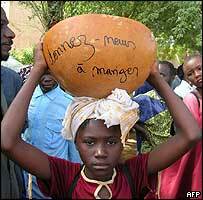 Some 2,000 people march through the streets of the capital, Niamey, demanding free food. The government refuses their demands, saying this would be "foolish", even though some 150,000 children are severely malnourished. Hundreds of people are reported to be fleeing hunger in Niger and crossing the border into Nigeria. This protester's empty bowl says: "Give us something to eat"
The government still plays down the scale of the crisis, saying it should not be "politicised". The official in charge of food aid, Seydou Bakary, tells the AFP news agency: "We should be cautious not to exaggerate the situation - there is chronic malnutrition throughout the country, even during the most productive harvests." 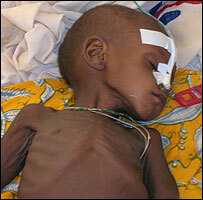 Niger is one of the countries whose debts are cancelled by the G8 club of the world's most powerful nations. But its food crisis is not mentioned at the G8 summit in Gleneagles. The WFP triples the number of people it is helping, to 1.2m. BBC's Idy Barou report on the crisi from central Niger for the BBC News Website. As news of more children starting to starve emerges, the top United Nations aid official says the crisis could have been averted if action had been taken earlier. The UN renews and increases its appeal to $30m - $10m is received. "The world wakes up when we see images on the TV and when we see children dying," the UN's Jan Egeland tells the BBC's World Today programme. "We have received more pledges in the past week than we have in six months. But it is too late for some of these children."